This weekend was the first "Tarifa International Beach Polo Championships 2014" which took place at Playa de Los Lances, Tarifa, organised by Polo4Ever. The winning team, McLaren/Guarnieri consisting of Andrew Nulty, César Miño and Diogo Gallego, beat team "Credit Suisse" – Hernan Pieres, Sophie Stanek and Carlos Piñal Alvarez, in the final on Sunday, by a extremely close score of 8 goales -7. Team Scapa beat Team Sunseeker in the 3th and 4th play off. Andrew Nulty was awarded "Most Valued Player" who received a watch from Gomez & Molina Jewelers. The winners were honored to lift the cup for the first ever edition of Beach Polo in Tarifa, however, all participants received gifts donated by sponsors such as Scapa and Okley. After the first days event, celebrations were held at Club Zuco97, and catering was provided by GOYO from Marbella.The following day a asado/barbeque took place on the beach next to the polo pitch at Chiringuito Le Club 7. Over each of the two days Juvé & Camps provided a endless supply of the best selection of cava and wine for all guests. Attendance at both of the sporting events as well as the after parties "has been a success," declared one of the event’s organisers, Isabel de Borbón; while stating: "after the great reception received from the public, media and local authorities, we cannot wait to begin preparation for the second edition of the Tarifa Beach Polo Championships next year." Spectators from Tarifa, Marbella and even further gathered to enjoy the weekend’s events. The support received from local institutions has also been unanimous. The sporting event was attended by the Mayor of Tarifa, Juan Andrés Gil. Among the spectators were a variety of familiar faces including, Prince Pablo de Hohenlohe and his family. As the rules dictate, the size of the playing area was smaller in comparison to that of a conventional polo match played on grass; this made it much easier for spectators to see each and every part of the game as it took place. Whilst preparation for the championship was underway, Johnny Wheeler (of Polo4Ever), also responsible for the event, stated: "We have taken several years to choose the ideal location for this first championship. Finally we decided on the beaches of Tarifa because they are among the best in Europe for this sport, thanks to the slim and compact sand. In addition, the town has a good infrastructure, experience in other championships, such as Kite and Windsurfing, and the people are extremely friendly because they are accustomed to tourism." The rules of Beach Polo are very similar to those of grass, except for minor details. One of them being that teams are made up of three players instead of four due to the smaller size of the playing area. 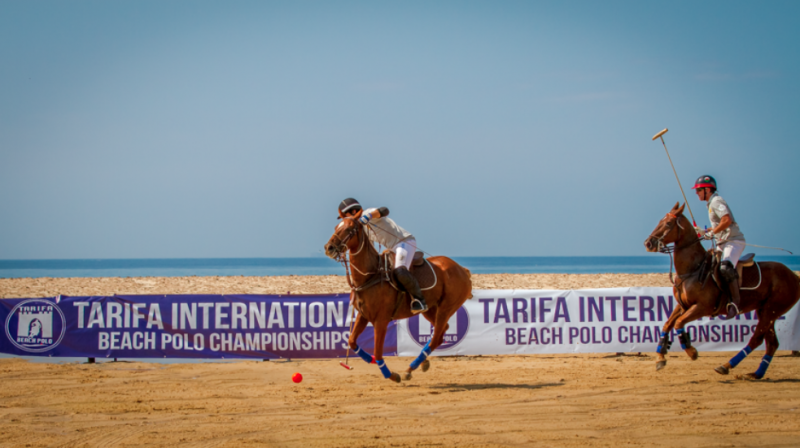 Event held: First edition of the “Tarifa International Beach Polo Championships 2014". Location: Playa de los Lances, Tarifa. Date: 27th and 28th of September 2014.